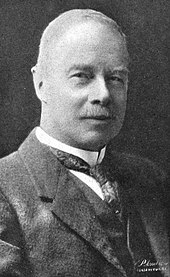 George Hudson proposed the idea of daylight saving in 1895. The German Empire and Austria-Hungary organized the first nationwide implementation starting on April 30, 1916. Many countries have used at various times since then, particularly since the 1970s energy crisis. DST is generally not observed near the equator, where sunrise times do not vary enough to justify it. Some countries observe it only in some regions; for example, southern Brazil observes it, while equatorial Brazil does not. Only a minority of the world's population uses DST, because Asia and Africa generally do not observe it. Port Arthur, Ontario, was the first city in the world to enact DST on July 1, 1908. This was followed by Orillia, Ontario, introduced by William Sword Frost while mayor from 1911 to 1912. The first states to adopt DST ( German: Sommerzeit) nationally were those of the German Empire and its World War I ally Austria-Hungary commencing April 30, 1916, as a way to conserve coal during wartime. Britain, most of its allies, and many European neutrals soon followed. 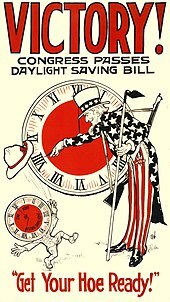 Russia and a few other countries waited until the next year, and the United States adopted daylight saving in 1918. Most jurisdictions abandoned daylight saving time in the years after the war ended in 1918, with exceptions including Canada, the UK, France, Ireland, and the United States. It became common during World War II, and was widely adopted in America and Europe from the 1970s as a result of the 1970s energy crisis. Since then, the world has seen many enactments, adjustments, and repeals. For specific details, see Daylight saving time by country. Some clock-shift problems could be avoided by adjusting clocks continuously  or at least more gradually —for example, Willett at first suggested weekly 20-minute transitions—but this would add complexity and has never been implemented. ^ a b Tuuli A. Lahti; Sami Leppämäki; Jouko Lönnqvist; Timo Partonen (2008). "Transitions into and out of daylight saving time compromise sleep and the rest–activity cycles". BMC Physiology. 8: 3. doi: 10.1186/1472-6793-8-3. PMC 2259373. PMID 18269740. ^ a b Stephen Tong; Joseph Williams (2007). "Are you prepared for daylight saving time in 2007?". IT Professional. 9 (1): 36–41. doi: 10.1109/MITP.2007.2. ^ Benjamin Franklin, writing anonymously (April 26, 1784). "Aux auteurs du Journal". Journal de Paris (in French) (117): 511–513. Its first publication was in the journal's "Économie" section in a French translation. The revised English version [cited February 13, 2009] is commonly called "An Economical Project", a title that is not Franklin's; see A.O. Aldridge (1956). "Franklin's essay on daylight saving". American Literature. 28 (1): 23–29. doi: 10.2307/2922719. JSTOR 2922719. ^ Eviatar Zerubavel (1982). "The standardization of time: a sociohistorical perspective". The American Journal of Sociology. 88 (1): 1–23. doi: 10.1086/227631. ^ "New Zealand time". New Zealand Geographer. 4 (1): 104. 1948. doi: 10.1111/j.1745-7939.1948.tb01515.x. ^ Ian R. Bartky; Elizabeth Harrison (1979). "Standard and daylight-saving time". Scientific American. 240 (5): 46–53. Bibcode: 1979SciAm.240e..46B. doi: 10.1038/scientificamerican0579-46. ISSN 0036-8733. ^ Daniel S. Hamermesh; Caitlin Knowles Myers; Mark L. Pocock (2008). "Cues for timing and coordination: latitude, Letterman, and longitude". Journal of Labor Economics. 26 (2): 223–246. CiteSeerX 10.1.1.598.1828. doi: 10.1086/525027. ^ a b Havranek, Tomas; Herman, Dominik; Irsova, Zuzana (June 1, 2018). "Does Daylight Saving Save Electricity? A Meta-Analysis". The Energy Journal. 39 (2). doi: 10.5547/01956574.39.2.thav. ISSN 1944-9089. ^ a b c d e Myriam B.C. Aries; Guy R. Newsham (2008). "Effect of daylight saving time on lighting energy use: a literature review". Energy Policy. 36 (6): 1858–1866. doi: 10.1016/j.enpol.2007.05.021. ^ Ryan Kellogg; Hendrik Wolff (2008). "Daylight time and energy: evidence from an Australian experiment". Journal of Environmental Economics and Management. 56 (3): 207–220. doi: 10.1016/j.jeem.2008.02.003. An earlier version is in: Ryan Kellogg; Hendrik Wolff (2007). "Does extending daylight saving time save energy? Evidence from an Australian experiment". CSEMWP 163. Center for the Study of Energy Markets. ^ Wee-Kean Fong; Hiroshi Matsumoto; Yu-Fat Lun; Ryushi Kimura (2007). "Energy savings potential of the Summer Time concept in different regions of Japan from the perspective of household lighting". Journal of Asian Architecture and Building Engineering. 6 (2): 371–378. doi: 10.3130/jaabe.6.371. ^ Yoshiyuki Shimoda; Takahiro Asahia; Ayako Taniguchia; Minoru Mizuno (2007). "Evaluation of city-scale impact of residential energy conservation measures using the detailed end-use simulation model". Energy. 32 (9): 1617–1633. doi: 10.1016/j.energy.2007.01.007. ^ Mark J. Kamstra; Lisa A. Kramer; Maurice D. Levi (2000). "Losing sleep at the market: the daylight saving anomaly" (PDF). American Economic Review. 90 (4): 1005–1011. CiteSeerX 10.1.1.714.2833. doi: 10.1257/aer.90.4.1005. ^ Luisa Müller; Dirk Schiereck; Marc W. Simpson; Christian Voigt (2009). "Daylight saving effect". Journal of Multinational Financial Management. 19 (2): 127–138. doi: 10.1016/j.mulfin.2008.09.001. ^ Michael J. Pinegar (2002). "Losing sleep at the market: Comment". American Economic Review. 92 (4): 1251–1256. doi: 10.1257/00028280260344786. JSTOR 3083313. ^ Mark J. Kamstra; Lisa A. Kramer; Maurice D. Levi (2002). "Losing sleep at the market: the daylight saving anomaly: Reply". American Economic Review. 92 (4): 1257–1263. doi: 10.1257/00028280260344795. JSTOR 3083314. ^ Susan A. Ferguson; David F. Preusser; Adrian K. Lund; Paul L. Zador; Robert G. Ulmer (1995). "Daylight saving time and motor vehicle crashes: the reduction in pedestrian and vehicle occupant fatalities" (PDF). American Journal of Public Health. 85 (1): 92–95. doi: 10.2105/AJPH.85.1.92. PMC 1615292. PMID 7832269. ^ Douglas Coate; Sara Markowitz (2003). "The effects of daylight and daylight saving time on US pedestrian fatalities and motor vehicle occupant fatalities". Accident Analysis & Prevention. 36 (3): 351–357. doi: 10.1016/S0001-4575(03)00015-0. PMID 15003579. ^ Alex Vincent; Stanley Coren (1998). "Effects of daylight savings time on collision rates". New England Journal of Medicine (Full free text). 339 (16): 1167–1168. doi: 10.1056/NEJM199810153391617. PMID 9776656. Data supporting Coren's half of this exchange are in: Stanley Coren (1998). "Sleep deficit, fatal accidents, and the spring shift to daylight savings time". INABIS '98. ^ Jason Varughese; Richard P. Allen (2001). "Fatal accidents following changes in daylight savings time: the American experience". Sleep Medicine. 2 (1): 31–36. doi: 10.1016/S1389-9457(00)00032-0. PMID 11152980. ^ J. Alsousoua; T. Jenks; O. Bouamra; F. Lecky; K. Willett (2009). "Daylight savings time (DST) transition: the effect on serious or fatal road traffic collision related injuries". Injury Extra. 40 (10): 211–212. doi: 10.1016/j.injury.2009.06.241. ^ Tuuli A. Lahti; Jari Haukka; Jouko Lönnqvist; Timo Partonen (2008). "Daylight saving time transitions and hospital treatments due to accidents or manic episodes". BMC Public Health. 8: 74. doi: 10.1186/1471-2458-8-74. PMC 2266740. PMID 18302734. ^ Mats Lambe; Peter Cummings (2000). "The shift to and from daylight savings time and motor vehicle crashes". Accident Analysis & Prevention. 32 (4): 609–611. doi: 10.1016/S0001-4575(99)00088-3. PMID 10868764. ^ Christopher M. Barnes; David T. Wagner (2009). 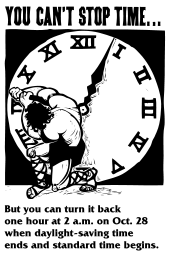 "Changing to daylight saving time cuts into sleep and increases workplace injuries" (PDF). Journal of Applied Psychology. 94 (5): 1305–1317. doi: 10.1037/a0015320. PMID 19702372. ^ Doleac, Jennifer L.; Sanders, Nicholas J. (December 8, 2015). "Under the Cover of Darkness: How Ambient Light Influences Criminal Activity". Review of Economics and Statistics. 97 (5): 1093–1103. doi: 10.1162/rest_a_00547. ^ Rachel Pain; Robert MacFarlane; Keith Turner; Sally Gill (2006). "'When, where, if, and but': qualifying GIS and the effect of streetlighting on crime and fear". Environment and Planning A. 38 (11): 2055–2074. doi: 10.1068/a38391. ^ Smith, Austin C. (2016). "Spring Forward at Your Own Risk: Daylight Saving Time and Fatal Vehicle Crashes". American Economic Journal: Applied Economics. 8 (2): 65–91. CiteSeerX 10.1.1.676.1062. doi: 10.1257/app.20140100. ISSN 1945-7782. ^ Michael Rosenberg; Lisa Wood (2010). "The power of policy to influence behaviour change: daylight saving and its effect on physical activity". Australian and New Zealand Journal of Public Health. 34 (1): 83–88. doi: 10.1111/j.1753-6405.2010.00479.x. PMID 20920111. ^ A.V. Parisi; J. Turner; D.J. Turnbull; P. Schouten; N. Downs (2008). "Influence of summer daylight saving time on scattered erythemal solar ultraviolet exposures" (PDF). Journal of Photochemistry and Photobiology B: Biology. 91 (1): 35–40. CiteSeerX 10.1.1.575.2748. doi: 10.1016/j.jphotobiol.2008.01.010. 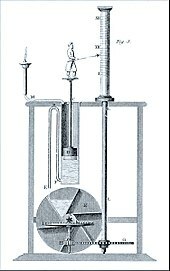 PMID 18321724. ^ Henry Olders (2003). "Average sunrise time predicts depression prevalence". Journal of Psychosomatic Research. 55 (2): 99–105. doi: 10.1016/S0022-3999(02)00479-8. PMID 12932507. ^ Sipilä, JO; Ruuskanen, JO; Rautava, P; Kytö, V (2016). "Changes in ischemic stroke occurrence following daylight saving time transitions". Sleep Medicine. 27–28: 20–24. doi: 10.1016/j.sleep.2016.10.009. PMID 27938913. Pablo Valdez; Candelaria Ramírez; Aída García (2003). "Adjustment of the sleep–wake cycle to small (1–2h) changes in schedule". Biological Rhythm Research. 34 (2): 145–155. doi: 10.1076/brhm.34.2.145.14494. ^ Michael Berk; Seetal Dodd; Karen Hallam; Lesley Berk; John Gleeson; Margaret Henry (2008). "Small shifts in diurnal rhythms are associated with an increase in suicide: the effect of daylight saving". Sleep and Biological Rhythms. 6 (1): 22–25. doi: 10.1111/j.1479-8425.2007.00331.x. ^ Imre Janszky; Rickard Ljung (2008). "Shifts to and from daylight saving time and incidence of myocardial infarction". New England Journal of Medicine. 359 (18): 1966–1968. doi: 10.1056/NEJMc0807104. PMID 18971502. Lay summary – Los Angeles Times (October 30, 2008). ^ Harrison, Yvonne (August 2013). "The impact of daylight saving time on sleep and related behaviours". Sleep Medicine Reviews. 17 (4): 285–292. doi: 10.1016/j.smrv.2012.10.001. PMID 23477947. ^ Barnes, Christopher M.; Drake, Christopher L. (November 2015). "Prioritizing Sleep Health". Perspectives on Psychological Science. 10 (6): 733–737. doi: 10.1177/1745691615598509. PMID 26581727. ^ Cho, Kyoungmin; Barnes, Christopher M.; Guanara, Cristiano L. (February 2017). "Sleepy Punishers Are Harsh Punishers". Psychological Science. 28 (2): 242–247. doi: 10.1177/0956797616678437. PMID 28182529. ^ Albert E. Waugh (1973). Sundials: Their Theory and Construction. Dover. Bibcode: 1973sttc.book.....W. ISBN 978-0-486-22947-8. ^ Leith Holloway (1992). "Atmospheric sun protection factor on clear days: its observed dependence on solar zenith angle and its relevance to the shadow guideline for sun protection". Photochemistry and Photobiology. 56 (2): 229–234. doi: 10.1111/j.1751-1097.1992.tb02151.x. PMID 1502267. Richard A. Meade (1978). "Language change in this century". English Journal. 67 (9): 27–30. doi: 10.2307/815124. JSTOR 815124.